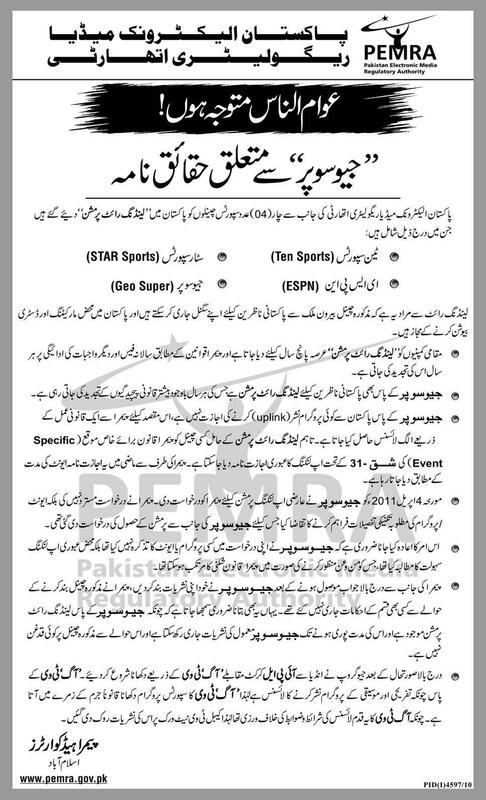 PEMRA (Pakistan Electronic Media Regulatory Authority) has issued his concerns or point of view about ban of GEO Super. According to PEMRA Geo Super is not banned/blocked by PEMRA, but GEO itself has stopped their GEO Super Transmission. AAG TV is blocked by PEMRA because they were showing IPL 2011 but AAG TV don't have license of Sports transmissions that's why PEMRA stopped AAG TV's telecast.